Ships’ Ballast Water and Sediments (BWM) has been approved and will enter into force on September 8, 2017. Deemed as an environmental necessity, it cre- ates an enormous operational challenge for the mari- time industry. During the 1970s and 1980s, ship owners worked operations in heavy solids and/or turbid water at a re- to achieve real world operational freedom, every ship through the implementation and enforcement of the duced system ? owrate. It will help keep the ? lter and will rely on smart system automation and a special Federal Water Pollution Control Act (FWPCA) which biocidal system from overloading causing a system operational process to manage heavy silting periods. required the Coast Guard to, “establish procedures, fault and automatic shutdown. Having worked with natural water treatment systems these critical environmental issues with the goal of proper ? ow/kill rate at constant dosage control. for decades, we know what works and what does not. keeping ecosystems intact. A robust BWM system will: dustry. In fact, many power plants that use river water •Use a back washable ? lter with a prescreen water NOTE: Maritime Solutions, Inc. (MSI) and ABB have for turbine bearing cooling have utilized these design chamber to collect large debris. 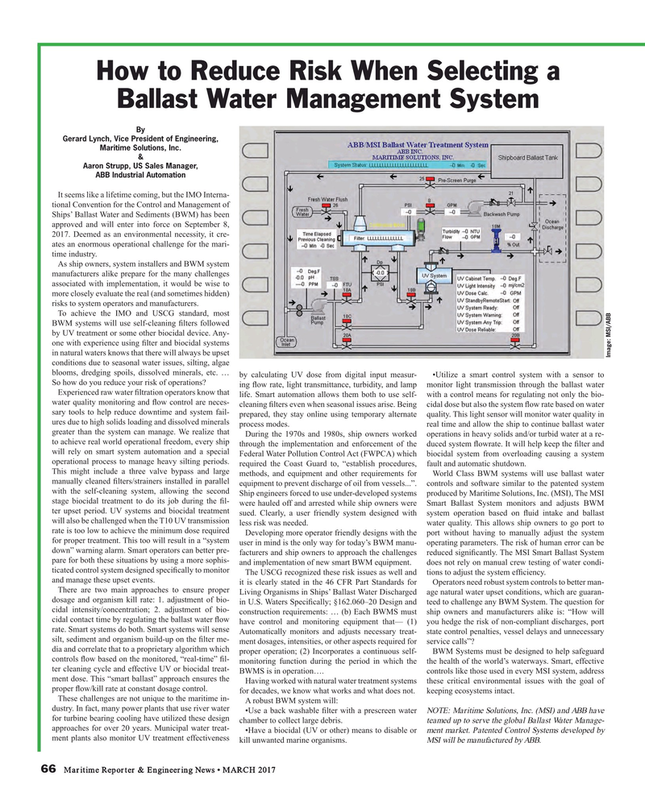 teamed up to serve the global Ballast Water Manage- approaches for over 20 years. Municipal water treat- •Have a biocidal (UV or other) means to disable or ment market. Patented Control Systems developed by ment plants also monitor UV treatment effectiveness kill unwanted marine organisms. MSI will be manufactured by ABB.